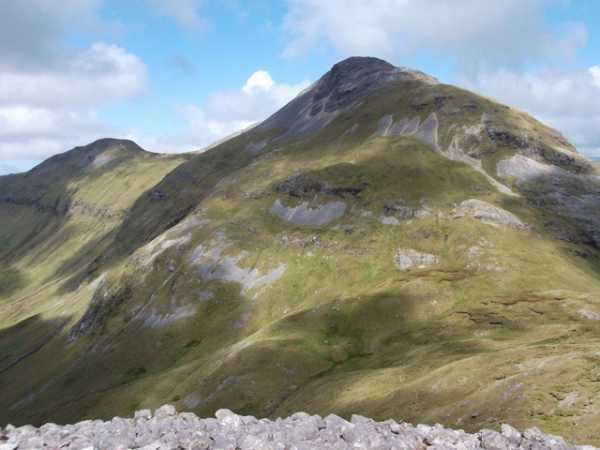 This photo of Binn Bhàn was taken from the slopes of Binn Bhraoin North Top, and it offers a new perspective of the highest point of Galway. When on the summit of Binn Bhàn last year I contemplated whether there was a safe route down to Màm Eidhneach (Maumina col), between Binn Bhàn and Binn Dubh (Bencollaghduff) in the lower right of the photo. I didn’t take the chance, and looking at the mountain from Binn Bhraoin last week I could see that a route would have been tricky to say the least.